This page includes information about new appointments and positions in FIG member associations and other organisations that are of interest to FIG and its members. The second part consists of short news and pictures of visits by FIG representatives or visits to the FIG office. Unfortunately the news was brought to us that Clifford Dann passed away on 19 september 2017 at a respectable age of 90. 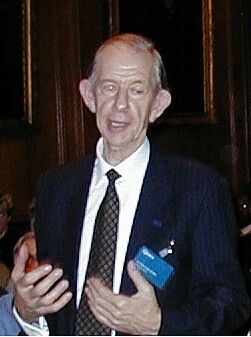 Clifford Dann was a well respected honorary member of FIG. The Service of Celebration and Thanksgiving for the life and work of Clifford Dann will take place in St. Margaret’s Church, Westminster at 2.30 pm on Tuesday 10th April 2018, followed by refreshments in the Lecture Hall of RICS Headquarters. Write enclosing a stamped self-addressed envelope to Mr M Arnoldi, Room 10, 20 Dean’s Yard, London SW1P 3PA. Tickets will be posted by 28th March. You are advised to retain your ticket as it will also give access to the RICS building at 12 Great George Street, Parliament Square, London SW1P 3AD for the refreshments. You may find it expedient to deposit coats or bags at reception in the RICS Headquarters prior to the ceremony and then walk across Parliament Square to St. Margaret’s Church for the service, because there will be a bag search on arrival at the church. For this purpose, the RICS will be open from 1.30 pm as entrance to St. Margaret’s Church will be from 1.45 pm. It is with sorrow that we inform that Jo Henssen died 7 September 2015. Jo Henssen was a honorary member of FIG and he has participated in many FIG events throughout the years. Dr. Ron Adler was born in Warsaw Poland in 1927. Ron served as a surveyor in the British army during World War II. He arrived at Israel in 1953 after finalizing his B.A degree in Geodesy from Redding University. Ron got his M.A from Ohio University in 1963, and Doctorate from the Technion in 1970. Dr. Adler started his career in the Survey of Israel immediately after finishing his B.A in 1953. In 1965 he was nominated as the chief cadaster engineer, In 1968 he became the deputy director general and in 1971 he was nominated as the Director General of the Survey of Israel. In 1972 Dr. Adler organized the FIG working conference in Tel-Aviv. This was the first FIG event that surveyors attending from abroad hosted in Israel and at Israeli surveyor's homes. Acquisition of modern instruments in the photogrammetry and field survey. He got the first GPS instruments and analytical stereoplotters, into the SOI. Strengthening the relations with international professional organizations – FIG, ASPRS, ISPRS, USGS. As the DG, he expedited the appropriation for the SOI, in order to initialize its GIS operations. From that perspective, we can declare that Dr. Adler's visionary directive decisions served as the basis for our current technological advancements. 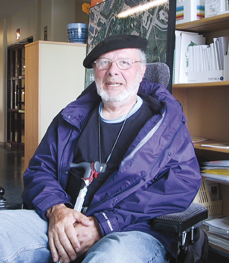 After his retirement in 1992, Ron continued his academic career, published several books, and served as visitor professor at some universities. In 2008-2009 he served as a honored member in the organization team for the Eilat 2009 FIG working week. To our grief, Dr. Adler passed away in August 2015. 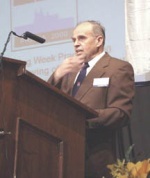 After ten years serving as Secretary General of PAIGH, Pan American Institute of Geography and History, Santiago Borrero, Colombia, stepped down from the post on 7 February 2014. PAIGH, a sister society to FIG, is a part of the Inter-American system coordinated by the Organization of American States – OAS. Santiago Borrero says: "It has been a great personal and professional experience and I hope I have contributed to the institutional development of the Pan American specialized community working in the areas of geospatial information, governance and development". Rodrigo Barriga, Chile, is taking over the position as Secretary General. 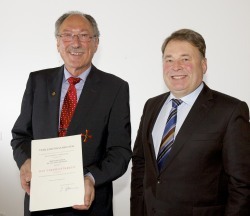 Prof. Holger Magel receives The German Honour "Bundesverdienstkreuz 1. Klasse"
November 2013 former FIG President Holger Magel had the great honour to receive the German "Bundesverdienstkreuz 1. Klasse" for his long term work in research, development and teaching and for his work on the development on the development of Land, not only in Germany but world wide. Professor Magel has expanded the Department of Land Tenure and Land Development at the University of Munich into an Internationally recognised centre and has earned a reputation as a global ambassador for the development of Land and rural areas. Prof. Holger Magel receives the certificate at a celebration on 22 July 2013 by President Wolfgang Herrmann in Garchinger TUM Institute of Advanced Studies (IAS) Not many experience the honour to be appointed "Emeritus of Excellence", however past FIG President Holger Magel received this outstanding award at a celebration on 22 July 2013, as a sign of the highest award from the Technical University München, TUM. 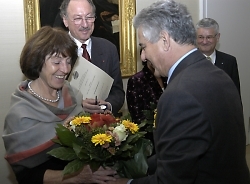 The award is given for "excellent initiatives within Germany" and is only appointed to researchers who have a particular scientific reputation and who with their outstanding personality have contributed actively throughout many years for the development and reputation of the University. IAt the age of 85 Carl-Olof Ternryd passed away in July 2013. Carl-Olof Ternryd graduated from the Royal Institute of Technology in 1953, and made a long career in the service of the State Road Administration. In this period the Swedish road network increased to the current dimensions. He served as Director-General 1978-82, after which he joined the Defence Materiel Administration FMV's as Director General. He has served as President of FIG in the late 1970'ies and has been very active throughout all the years. 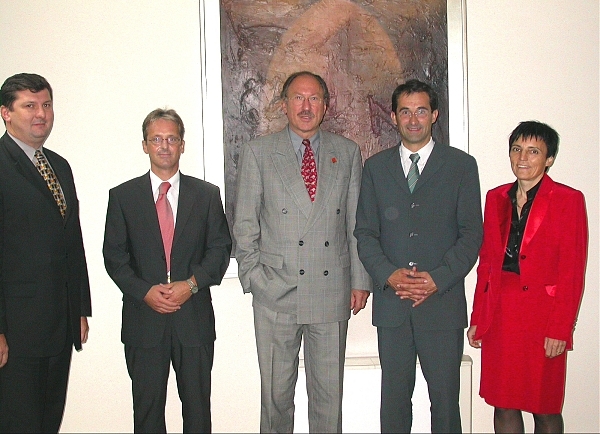 Even in 2008 when the FIG Working Week was taking place in Stockholm, Sweden, he contributed as senior advisor. It is with sorrow that we inform that Alan Wright died suddenly of a heart attack at the end of June 2013. Alan Wright was a well known face in FIG and has participated in many FIG events throughout the years. He was involved in the FIG International Institution for the History of Surveying and Measurement. The trustees of the American University for Science and Technology of California has granted Aziz Hilali, Morocco, the degree of Honorary Doctor of Philosophy (option: Civil Engineering, Surveying and Topology), in recognition of his career and his quality as president of the Mediterranean Union of surveyors. FIG congratulates Aziz Hilali. William “Rad” Radlinski passed away on Friday 15 February 2013 at the age of 92 after a long and fruitful life. For three years in the mid 70'ies he was President of FIG and was afterwards appointed FIG Honorary President. During the many years after his presidency, he has followed FIG closely and many FIG members have very fond memories of being together with William Radlinski. FIG thanks for his both formal and informal contributions to FIG. 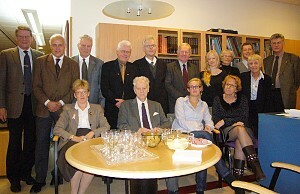 Seppo Härmälä passed away on Thursday, 3 January 2013, in Helsinki at the age of 94. He acted as the Chair of Commission 2 from 1985 to 1987 and as the Vice-President of FIG from 1988 to 1991. Härmälä’s role in FIG was active and creative and his characteristics of humour and social skills made him popular during meetings and social events. He promoted the so-called Chain of Struve to be nominated as one of the World Heritage sites of UNESCO, just to mention one of his achievements in FIG. Before his retirement in 1985 Härmälä’s civil post since 1972 was the Deputy Director General of the National Survey of Finland. Mr. C. H. (Charlie) Weir passed away peacefully September 24, 2012. Charlie has been active in FIG for 16 years. He served as President from 1985 to 1987. FIG thanks for his contribution and active role. Milan Klimes has been very active in FIG. In 1973 Milan Klimes was elected the first president of the Czechoslovak National Committee for FIG and remained in this position for over 20 years. Thanks to him the Czechoslovak and later the Czech delegations always played an active role at the FIG Congresses, Working Weeks, Exhibitions and Congresses. Due to his contribution and very active role in FIG he was appointed Honorary Member of FIG. Milan Klimes designed the FIG flag and initiated the FIG anthem which was composed by the Czech composer Jiri Simek, also a member of the Czechoslovak Delegation to FIG. FIG Honorary President, Professor Holger Magel was awarded with the prestigious Silver Commanders Cross Order by the Austrian Region "Niederösterreich" in for his pioneering contributions to the practical and scientific development of the rural development in Europe for many years, which "Niederösterreich" has particularly benefited from. 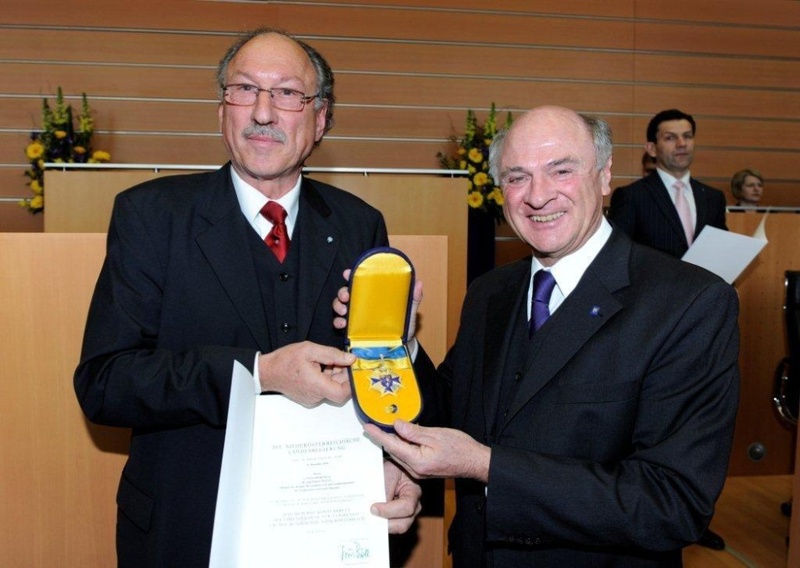 He received the order by Govenor Dr. Erwin Pröll on 1st of March 2011. President Stig Enemark at the door to the Queens castle. 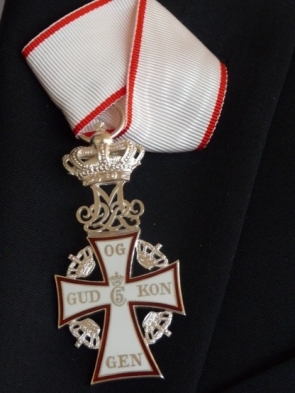 FIG President, Professor Stig Enemark has been awarded the prestigious Danish Order “Knight of Dannebrog” for his outstanding service to the Danish surveying profession and to the international surveying community. The Order is named after the Danish flag (Dannebrog) and is awarded directly by the Queen based on recommendation from, in this case, The National Survey and Cadastre, Denmark. The award therefore should be seen also as recognition of the surveying profession in contributing to society and in supporting the global agenda. On 1 December 2010 Louise Friis-Hansen was appointed Office Manager for the FIG Office. She will be looking forward to the cooperation with all members and persons involved in FIG. On 1 January a new Office Coordinator, Hanne Elster, started in the office also servicing members and friends of FIG. Markku Villikka continues as FIG Director. 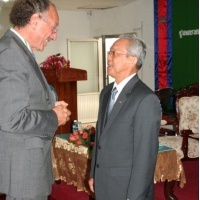 On 30 September 2010 Prof. Dr.-Ing. 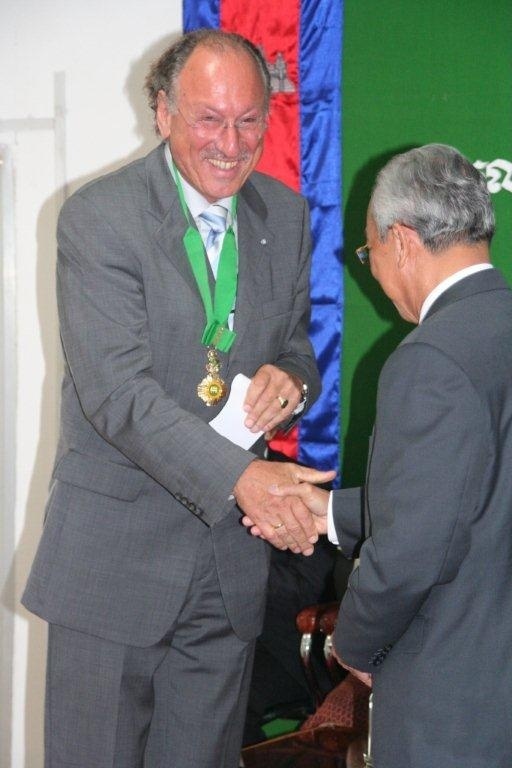 Holger Magel was appointed "Commander of the Royal Order of SOWATHARA" by Prime Minister Samdech Hun Sen. 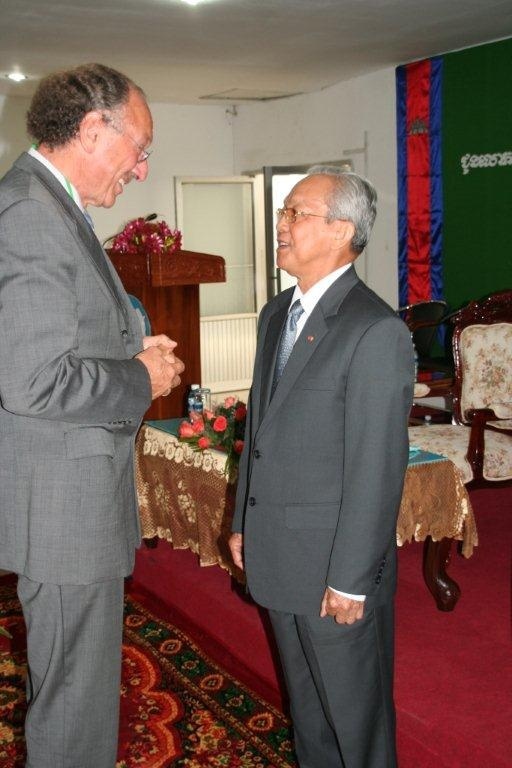 The order was given because of Holger Magel's extraordinary work establishing a sustainable Land Policy in Cambodia. Prof. Holger Magel received the order, founded in 1923, by Senior Minster Prof. Im Chhun Lim. In his speech, Im Chhun Lim especially mentioned the personal engagement of Holger Magel and his department by building up the Spatial Planning Policy in Cambodia and by establishing a Capacity Building Programme at an academic and professional level. The organising committee of FIG Working Week met for the last time 28 October in Stockholm to conclude their five year project. The comments from the participants ranked this working week among the most successful in the FIG history. The conference gathered 950 participants from 90 countries to Stockholm in June 2008. The organising committee was chaired by Svante Astermo. Read more: Report from the conference. Matt Higgins, FIG Vice President has been listed by GPS World in the group of 50+ leaders to watch in GNSS business. The list was published in the May 2008 issue of GPS World. Read what Matt Higgins is saying. The full article is also available on GPS World web site. Vice President Ken Allred was elected to the Legislative Assembly of the Province of Alberta in a general election on March 3, 2008 as a representative of the Alberta Progressive Conservative Party. The historic election, elected Premier Ed Stelmach and 72 Progressive Conservative members, out of a total of 83 seats in Alberta’s Legislature, with 9 Liberal members and 2 New Democrats holding the remaining eleven seats. The Alberta Legislature is the parliament for the province of Alberta, one of the ten provinces in Canada with a population of 3.5 million people. Read more about the elections. Prof. Emeritus Jean-Marie Becker, Honorary Member of FIG since 2004 and FIG Commission 5 Chair from 1998 to 2002 passed away on 27 October 2007. He was born in 1935 in France. 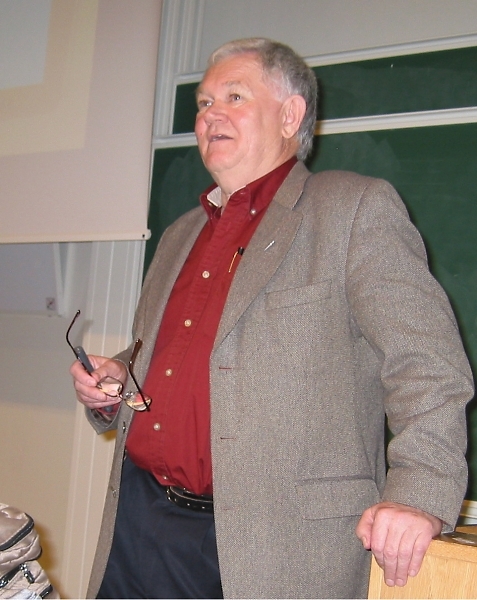 Becker started his career in the Swedish National Mapping Agency in 1966 and was appointed adjoint Professor at the Royal Institute of Technology in 1966. 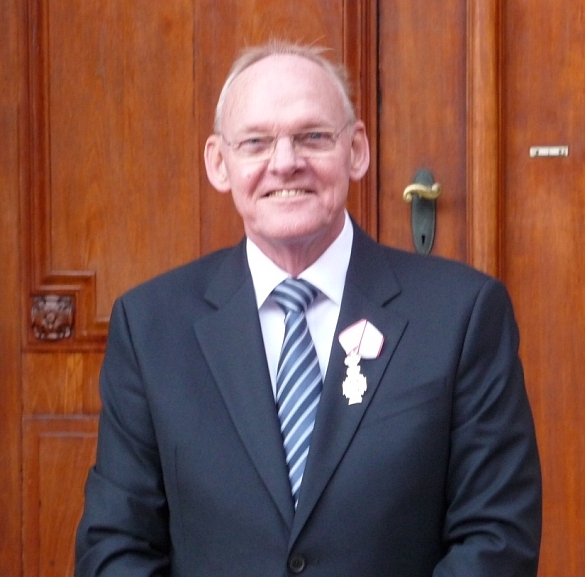 He was the Chair of FIG Commission 5 between 1998 and 2002 and was appointed FIG Honorary Member in 2004. Prof. Holger Magel received 11 July 2007 the Bavarian Order of Merit from Dr. Edmund Stoiber, Bavarian Minister President as recognition for his outstanding services to Bavaria and to the Bavarian People. The Bavarian Order of Merit is the highest Order of the Bavarian State and thus ranking higher than the German Federal Order of Merit (Bundesverdienstkreuz). Prof. Magel is the first surveyor in 26 years receiving this Order. Richard Meyer, Secretary General of the FIG Bureau during the first German presidency 1968-1971 and a member of the US led Bureau 1971-1974 - in Germany passed away 20 February 20007. He was born 11 June 1910. The German FIG Council congratulated Meyer at his 95th birthday in 2005 by saying that thanks to "Richard Meyer's life-long outstanding engagement for FIG one can really say: Richard Meyer made FIG well-known in Germany". Due to his multilingual language skills and his open minded character he has found a lot of friends worldwide and has brought the German way of surveying and land managing a good reputation. In memoriam Richard Meyer (1910 - 2007) by dr. Andreas Drees. Prof. Richard K. Bullard, FRICS passed away 25 January 2007. Prof. Bullard was a former national delegate, appointed by the RICS, to FIG and Secretary of Commission 2 (Professional Education) and also a corresponding member of Commissions 3 (Spatial Information Management) and 7 (Cadastre and Land Management). He was also representative of the Anglia Polytechnic University, Academic Member of FIG, to FIG. Prof. Bullard was working as a Researcher in the Department of the Built Environment at Anglia Polytechnic University APU and also worked as a freelance consultant specialising in land related issues. Started his surveying career in Zimbabwe and worked in 41 countries. Completed Masters in Engineering by research at the University of the Witwatersrand, Johannesburg, and Doctorate at Sheffield University. Worked in many of the activities of surveying including, cadastral, engineering, land management, photogrammetry, remote sensing, and topographical survey. He was a Fellow of the Royal Institution of Chartered Surveyors, and a Fellow of the Survey Institute of Zimbabwe. The Chair of the Geomatics Faculty Board (2002-2004) at the RICS and a Member of its Executive. An RICS APC examiner. With the European Faculty of Land Use and Development and is a Professor in Systemes d'Information du Territoire. His main interests in consultancy and research included land reform, land management, land consolidation and coastal zone management. Particular interest in the multidisciplinary aspects of land development for countries in transition and those in the developing world. Is the author of books, chapters and publications in the above fields of activity. A member of the editorial panel of International Land Management Series, published by Ashgate Publishing. Richard will be missed by his wife Pauline and surveyors all over the world. 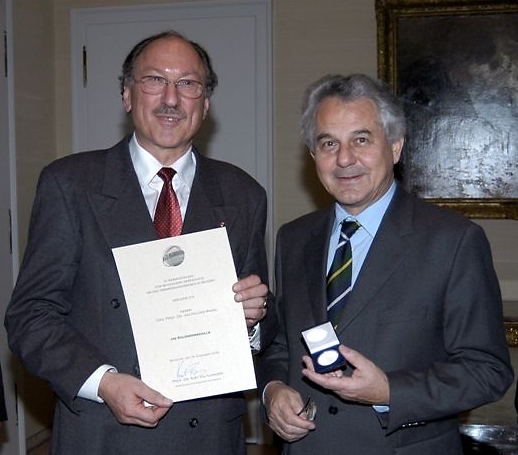 President Holger Magel received 18 December 2006 the Soldner Medal from Mr. Kurt Faltlhauser, the Bavarian Minister of Finance as recognition for his services to Bavaria and as serving as the FIG President and organising the XXIII FIG Congress in Munich. The medal is named after Astronomer and Mathematician Johann Georg von Soldner. Read more about the recognition and award in German..
President Holger Magel and Minister Kurt Faltlhauser. 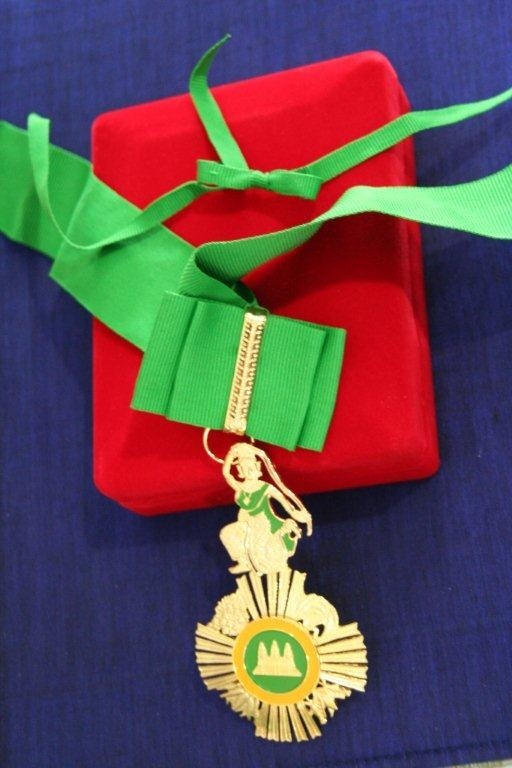 Prof. Holger Magel was awarded 13 December with a high profile Bavarian medal "Bayerische Verfassungsmedaille". 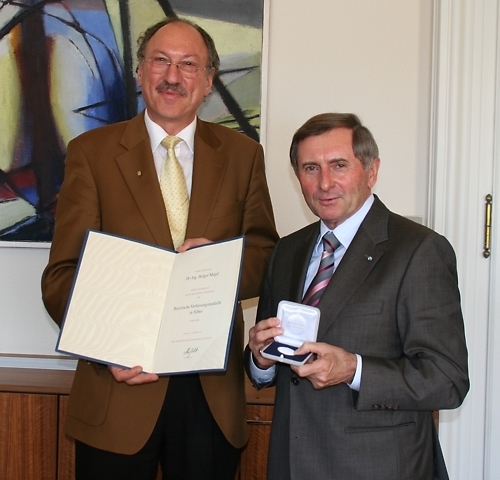 This silver medal was handed to FIG President Magel by Alois Glück, President of the Bavarian Parliament. The award was given to the FIG president and the President of the Bavarian Academy of Rural Areas in appreciation of his services on developing rural areas and building civil society through participatory involvement of citizens. 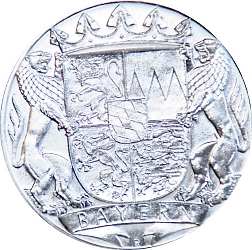 The medal is given by the Bavarian Parliament to persons, who have promoted the conditions of Bavaria. It belongs to the national honours, which are lent most rarely in the State of Bavaria. Prof. Dr hab. inz. Kazimierz Czarnecki, President of the Association of Polish Surveyors and a long-time leader of the Polish delegation to FIG passed away 23 August 2006 at the age of 67. Prof. Czarnecki was appointed posthumously as an Honorary Member of FIG at the FIG Congress in Munich. Prof. Willem Baarda, Honorary Member of FIG since 1959 passed away 2 January 2005. He was born in Leeuwarden 20.7.1917 and died in Delft. On January 2, 2005. Prof. Baarda was an honorary member of the Netherlands Geodetic Commission, member of the Royal Netherlands Academy of Arts and Sciences, honorary member of the Royal Institution of Chartered Surveyors (GB), honorary doctor of the University of Stuttgart. He received the Levallois Medal of the IAG in 1995. Read In Memoriam written by Prof. (em.) Dr.-Ing Wolfgang Torge. Geom. Antonio Benvenuti, CNG Councillor (left), Geom. Enrico Rispoli, Hon. Secretary of CNG, President Geom. 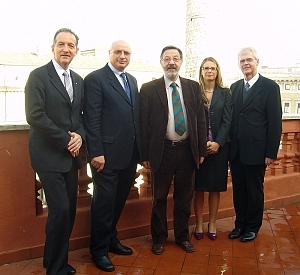 Fausto Savoldi, Ms. Maria Scorza, International Relations and FIG Director at the balcony of CNG in Piazza Colonna in Rome. FIG Director visited Consiglio Nazionale Geometri e Geometri Laureati (CNG) in Rome 17-18 November 2009 to prepare the FIG Working Week in Rome. This will be the first time that a major FIG event will be organised in Italy since 1960s. During the visit with President Fausto Savoldi and members of the CNG Council it became obvious that FIG Working Week in Rome will be a great experience both from professional and social aspects. Peter Dale and Stig Enemark. 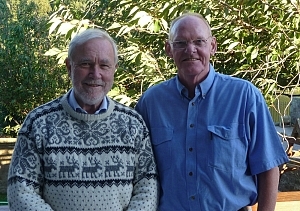 President Stig Enemark met with FIG Honorary President Peter Dale during Stig Enemark's visit to Scotland in September 2009. Peter Dale was the FIG President 1995-1999. He is very happy with the current commitment of FIG on contributing to the Global Agenda to see the way FIG has developed over the years especially with regard to the current commitment of contributing to the Millennium Development Goals through cooperation with the UN agencies and the World Bank. Peter Dale sends his very best regards and wishes to the FIG community. The Institution of Civil Engineering Surveyors, second FIG member association from United Kingdom celebrated the granting of its Royal Charter and 40 year anniversary at an event addressed by the Construction Industry Council 10 September 2009. Graham Watts OBE, Chief Executive of the Construction Industry Council, who has worked with the Institution for more than 20 years, spoke at the event and guests included representatives from industry partners including Balfour Beatty, Carillion, RICS, ICE, Network Rail, Construction Youth Trust and the Olympic Delivery Authority. 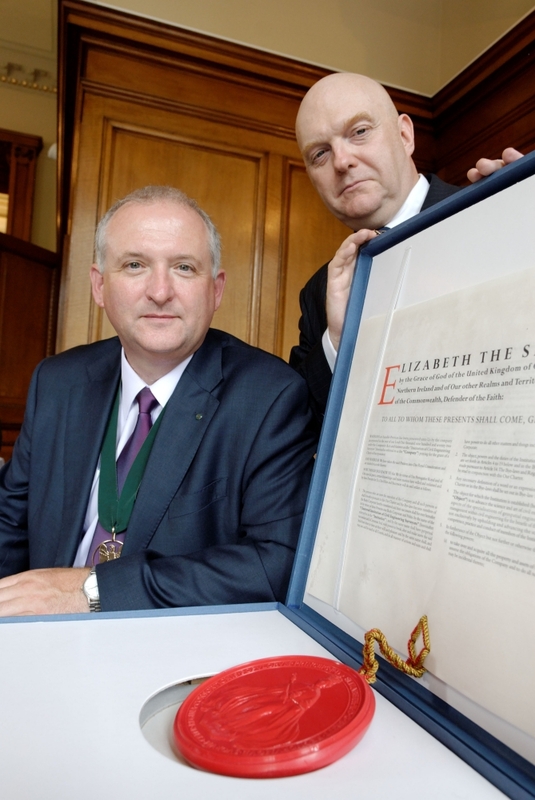 The Chartered Institution of Civil Engineering Surveyors (ICES) was established in 1969 in order to support the professional development of surveyors working in the civil engineering industry. Further information will be made available via the web-site www.ices.org.uk, and on the new web-site www.cices.org when it comes on-line in the next few weeks. 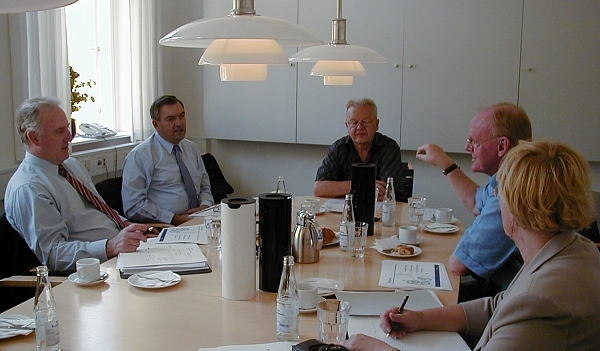 President Stig Enemark together with Presidents from the Nordic associations: Leiv Bjarte Mjoes (NJKF, Norway, left), Henning Elmstroem (DdL, Denmark), Svante Astermo, Past President, SLF/ASPECT, Sweden) and Pekka Halme (MIL, Finland). 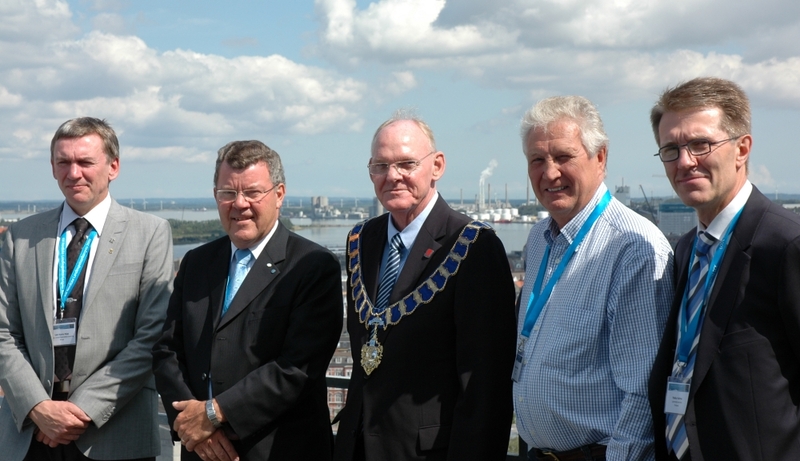 The four-yearly congress of Nordic surveyors was organised for the 21st time in Aalborg Denmark 5-7 August 2009. The conference rotates between four Nordic countries (Denmark, Finland, Norway and Sweden) and was this time arranged in the west coast of Denmark. The keynote address "From Measurement to Management - Toward a Spatial Enabled Society" was given by FIG President Stig Enemark. The other sessions discussed digital administration, preparations to climate change, surveyors' changing role to advisors and surveyors role in construction projects in digital era. The Nordic congress has a tradition as a family event and is held in Scandinavian languages, programme: http://public.ida.dk/ddl/nl09/fagligtprogram.htm. 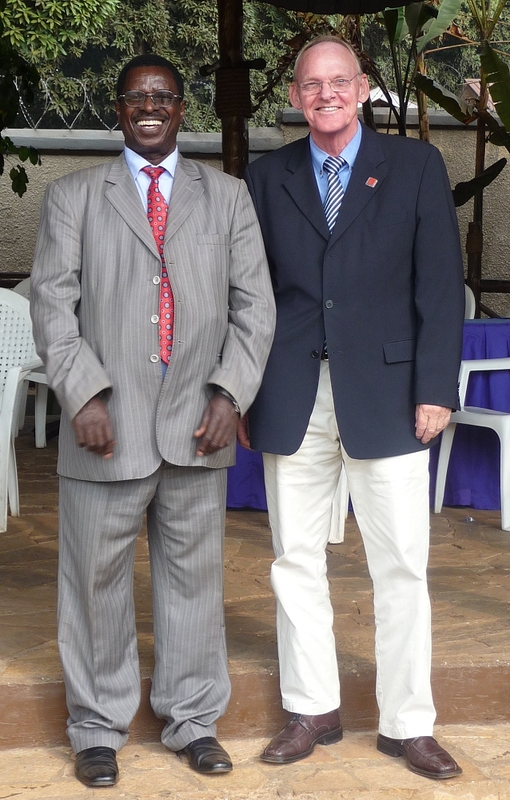 FIG President Stig Enemark and ISU President Nathan Behangana. 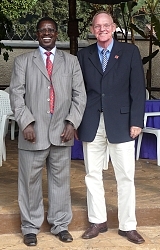 President Stig Enemark visited Uganda in late July 2009. During his visit met Mr. Nathan Behangana, President of the Institution of Surveyors Uganda (ISU) and other members of ISU. The institution has three chapters: Land Surveying; Quantity Surveying; and Valuation Surveying. In total the institution has 285 members plus 100 students. 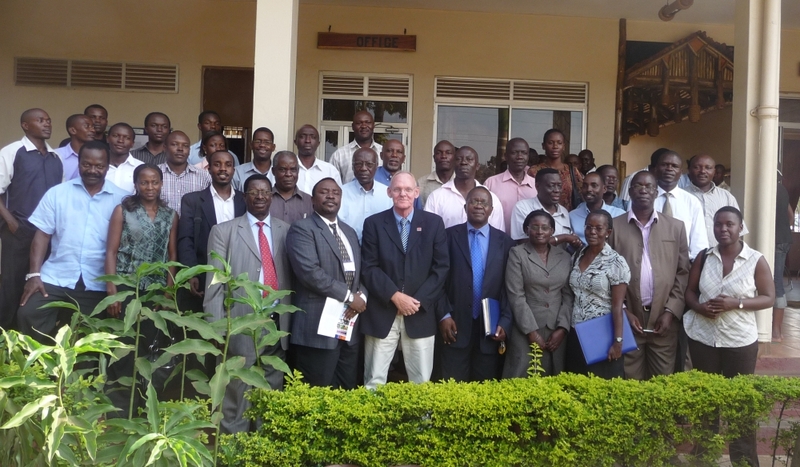 During his visit to Uganda for training the trainers in the area of surveying and land management (a World Bank project), President Enemark had the opportunity to have a meeting with the ISU that is currently not a member of FIG. The meeting was attended by around 50 surveyors, and was an excellent opportunity to explain about the role of FIG and benefits of being a member. ISU is fighting the same problems as most of their neighbouring countries such as Kenya and Tanzania. President Enemark is looking forward very much to welcome the Institution of Surveyors Uganda in the FIG family. Meeting with the members of ISU. Maanmittausalan ammattikorkeakoulu- ja opistoteknisten Liitto MAKLI ry, one of the two member associations from Finland celebrated its 50th Anniversary in Helsinki, Finland 23 April 2009. The celebration was highlighted with a reception were key people in MAKLI and partners were recognised. MAKLI also published a book on the history of the association. MAKLI represents about 1,200 surveyors that have BSc or technician education. 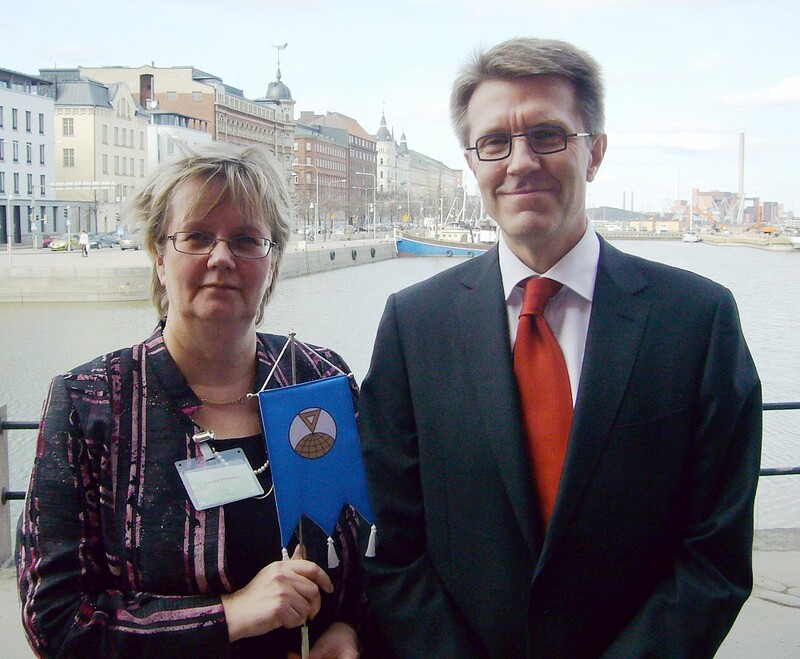 Ms. Carola Tiihonen, President of MAKLI and Mr. Pekka Halme, President of MIL (the Finnish Association of Surveyors) at the 50th Anniversary reception. Johann Jessenk, Intergraph and Gerhard Muggenhuber, former chair of FIG Commission 3. FIG Director visited Vienna 12 January 2009. He met with first with representatives of the Austrian Society for Surveying and Geoinformation. 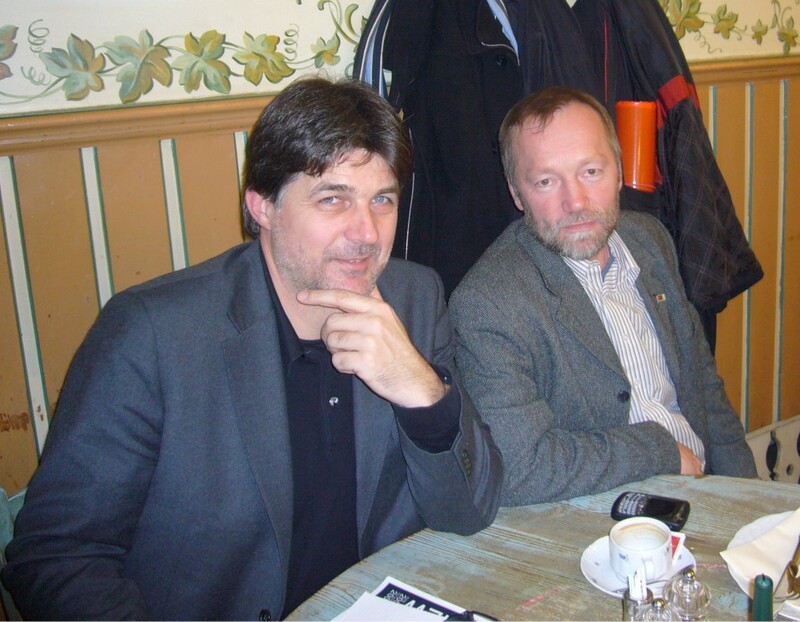 The meeting was attended by President Gert Steinkellner, Reinfried Mansberger and Gerhard Muggenhuber. At the meeting among actual other issues the FIG Commission 2 workshop in Vienna in February 2009 was discussed. The Director together with Gerhard Muggenhuber, former chair of FIG Commission 3 met also with Johann Jessenk from Intergraph. Johann is the new focal point for FIG co-operation in Intergraph, platinum member of FIG. At the meeting a partnership programme for the next three years was prepared. Vice President Ken Allred made a presentation on January 30, 2006 to the students in the Masters program at Lund University in Lund, Sweden. Students from the Master of Science in Engineering - Land Surveying and Management program at Lunds Tekniska Högskola have been active in FIG over the past several years giving presentation in Paris (2003) and Athens (2004). The M.Sc. program at Lund combines geomatics, law and economics to provide students with a good background in land management. Some of the specializations students can take in their later years are real estate economics, land use planning and geomatics. About 50 students, including a large percentage of female students, are admitted to the program each year. Visit to the Ministry of Environment: Warwick Watkins (to the left), Minister Tony Kelly, Niels Østergård, Stig Enemark and Virginia Knox. 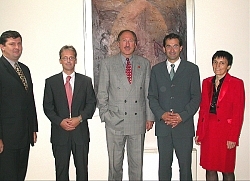 A delegation from New South Wales, Australia visited Denmark 4-5 July 2005. During the visit delegation visited the Ministry of Environment and the FIG office to get familiar with FIG and to discuss the arrangements of FIG Congress 2010 to be held in Sydney. The delegation was headed by the Hon. Tony Kelly, Minister for Lands and included Virginia Knox, Chief of Staff, Warwick Watkins, Director General, Department of Lands, Surveyor General and Registrar General and Richard Lyons, Director of the Office of Emergency Services. FIG was represented by Vice President Stig Enemark and Markku Villikka. During the visit to the Ministry of Environment, Niels Østergård explained the visitors the planning system and local governance reform in Denmark. Prof. Holger Magel, President of FIG visited Slovenia 30 September - 1 October. During the visit he met with Mr. Janez Kopac, Minister of Environment, Spatial Planning and Energy. Tomaz Petek, Member of the Executive Committee of the Association of Surveyors of Slovenia, Bojan Stanonik, M.Sc., M.Sc., President of the Association of Surveyors of Slovenia., Prof. Holger Magel, Janez Kopac, M.Sc., Minister of Environment, Spatial Planning and Energy and Bozena Lipej, Ph.D., Deputy Director General of Surveying and Mapping Authority. FIG receives ESRI "Special Achievement in GIS"
Jack Dangermond, President of ESRI, Markku Villikka, FIG and Mike Weir, ESRI at the award ceremony. 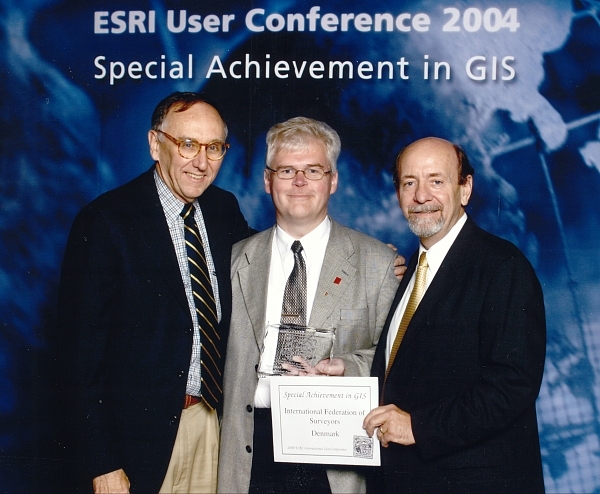 FIG received one of this year's ESRI "Special Achievement in GIS". 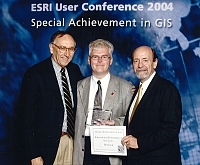 The award was given to FIG during the ESRI Users' Conference in San Diego in August 2004.